Being “tough” and being “difficult” are not the same thing. Being tough can work, but only if deployed sparingly at strategic points in negotiations. Being difficult for difficult’s sake never works. It simply breaks trust and creates resentment leading to a justifiable unwillingness in partners to compromise. Flexibility must be built into your position from the start. Not everything can be a red line. Oppos respect genuine red lines – they have them too. Claiming that every point is a red line though is crying wolf. The UK government has acted as if the EU27 countries are yet to discover the internet, and don’t have access to UK news. The EU27, though, knows the UK has backed itself into a corner on so many issues that its positions are fundamentally incompatible with the positive outcomes it has said it will get. The EU27 knows that this government will now find it politically impossible to go back with a big exit bill, or accept freedom of movement, or European Court of Justice jurisdiction over anything, no matter what it gets in return. 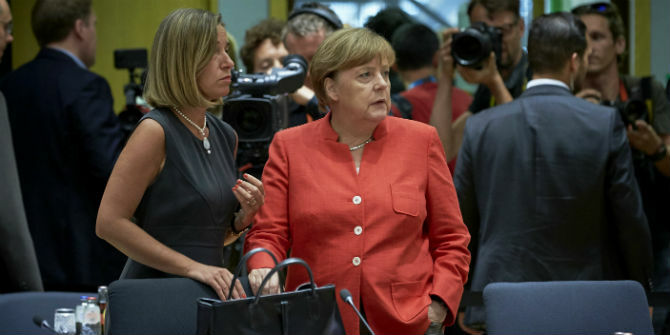 The EU27’s leaders very much want a deal, but the government’s approach has made any desire to look for solutions that suit the UK evaporate. Why bother when they don’t appear to want a deal anyway? Why give concessions when the UK’s constraints are entirely of its own making? In my view, the chances of this government getting any deal, let alone a good one, in only 21 months, are minimal. But I think it knows this. The Chancellor Philip Hammond, a lone moderate, pleaded for a transitional deal lasting up to four years. The level of complexity is too much for the UK’s Brexit negotiators, their preparations too poor, and the messaging too self-defeating. Note: This article gives the views of the author, and not the position of EUROPP – European Politics and Policy, nor of the London School of Economics. It is based on a Twitter thread originally posted here and was originally published at LSE Brexit. Steve Bullock worked at the UK Representation to the EU from 2010-2014 where he negotiated several EU regulations for the UK in EU Council working groups. He has also worked for the European Commission and the Department for International Development’s Europe Department. Another Munich type moment ahead?Appeasing the far right seems to be the May governments policy demonstrating an apparent total disregard for the national interest. Politicians ways of negotiating are certainly not what we teach in law schools and certainly nothing like what I was taught at LSE. The current policy is inept and frankly embarrassing. Diplomacy not political opportunism for the populist press or masses is required. When foreign policy is dictated by domestic party political concerns history warns us of the risks. Here the stakes are too high for any more mistakes. This is a matter for professional diplomats not amateurs. I agree. The way HMG set about dealing with the result of the June 2016 referendum was inept. The result wasn’t even overwhelming, 52%/48% in favour of leaving the EU, so Mrs May never had a particularly strong mandate to go charging off in any one direction. Her cabinet is also totally split following the disastrous results at the general election. I believe a far better negotiation stance would have been, to be far more humble. The politicians in the EU are also elected and know with their own electorate how stupid and fickle they can be. The message the voter may send to the initiator of the referendum may not be the answer to the question they have asked on the ballot paper. I’m not convinced that they don’t understand that the internet exists. It seems that the people in charge of this mess genuinely don’t care what Europe thinks. It must be because there is a plan to walk out with no deal. Boris Johnson’s claim, today, that we have no intention of paying any settlement and we’d still get an exceptional deal just defies all sense of trying to get an amicable resolution. At the very least this informs the rest of the world what our negotiating strengths are likely to be in trying to carve out other deals. There are several different problems at play here. One the EU is more interested in punishment then negotiation as is proven by their demands. Ranging from permanent extraterritoriality come on does anyone honestly believe that any country would accept this. I thought colonialism was finally out of fashion. Some separation payment I can see but 60 billion these negotiating positions are nearly as unreal as the UK’s position on how they will get a free trade agreement. Neither side is acting in good faith in these discussions at all. I would have to guess the EU either wants to force the UK to give up on exit, (which they can’t and convince their own voters their is any point to voting) or to damage and fragment the UK so badly no other country will ever consider stepping out of line. Bluntly the UK’s people are at best inept I would agree but the EU is NOT acting in good faith. They are making demands that CANNOT be accepted by the UK and they know it.